Office furniture can mean a lot of different things to people. For some, it is nothing but the generic and bland, Formica topped desks and rickety office chairs that adjust themselves at random moments, usually when you are least expecting them to do so. For others, office furniture is just another way to show off a flair for design and an eye for attractive and still functional furniture. There are a lot of places to get office furniture. Columbus, Ohio residents know that to get real Amish furniture without having to drive miles and miles out of their way, they have to come to the one store that has the largest selection and best prices. 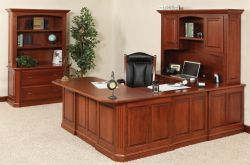 Each of these collections features a full sized (executive) desk and at least one piece of storage furniture. Most include a bookcase and an office cabinet, which can be used to suit your purposes. Desk chairs can be bought separately for each of these collections. Amish Originals has both a stationery chair and a swivel office chair to complete your home office collection. In addition to the collections listed above, there are a number of individual pieces that you can choose from to make your own collection. Once you have found and bought the perfect pieces of office furniture, the next step is to get it to your home. There are several options that you can use. First, you can have us deliver your item, which includes set up of the pieces once they arrive at your home. If you would like to save the small delivery fee, you can pick up your pieces on your own. Keep in mind the size and weight of the piece you have purchased when choosing this option. If you are from out of town, you can also have your piece shipped to you. Shipping may be very pricy, however, because these are fully assembled pieces of furniture and are often quite large as well as very heavy. They will need special boxes to be shipped in and padding so that they are not damaged. Your Columbus, Ohio furniture is one of a kind and worth all of the effort it will take to get to your home.